As many as 70% of people with diabetes are estimated to have some form of neuropathy, or nerve damage, and pain from the condition is notoriously difficult to treat. But according to new research from France, injections of botulinum toxin A, commonly known by the brand name Botox, may be able to reduce pain from peripheral neuropathy. Peripheral neuropathy impacts the nerves responsible for sensation and usually affects the hands, feet, arms, and legs. Symptoms include pain, tingling, coldness, sensitivity to touch, loss of sensation, and numbness. In people with diabetes, the condition is typically caused by high blood sugar levels, but other causes include vitamin B12 deficiency (which is especially common in those taking the oral diabetes medicine metformin), injury, cancer, and certain drugs. 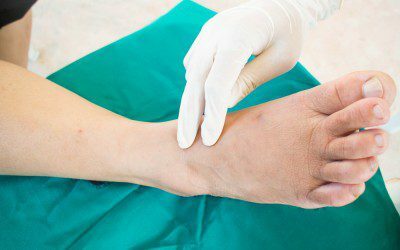 Previous research has suggested that botulinum toxin A may reduce pain from peripheral neuropathy, but the evidence has been weak. To further evaluate the use of this substance for managing neuropathic pain, investigators from the University Versailles Saint-Quentin looked at 66 people at two clinics in France and one in Brazil who met the criteria for likely or definitive neuropathy pain and who had had daily pain for at least six months. The pain primarily affected the subjects’ hands, forearms, feet, or ankles. The participants were randomly assigned to receive injections under the skin of either 5 units of botulinum toxin A or placebo (inactive treatment) in spots 1.5–2 centimeters apart, up to a maximum of 60 sites (300 units). The dose administered was determined by the how big the painful area was. The injections were again repeated after 12 weeks, with the dosage being adjusted according to the level of pain. To reduce pain from the injections, the subjects first received lidocaine and pilocaine cream for numbing purposes, in addition to sedation with 50% nitrous oxide and oxygen. Pain from the injections was found to be much worse in the hand and less so in the abdomen. The researchers found that, as measured on an 11-point scale, average pain intensity went from 6.5 at the start of the study to 4.6 after 24 weeks in those receiving the botulinum toxin, compared to an average of 6.4 at the start of the study to 5.8 at 24 weeks in those receiving placebo. Additionally, the proportion of participants experiencing at least a 30% reduction in pain was higher in the botulinum toxin group than in the placebo group. Those who benefited the most from the treatment appear to be people who have pain that is confined to a specific area and those with allodynia (pain in response to touch). Addressing neuropathy pain is a “highly unmet need” due to the currently limited number of treatment options, according to lead study author Nadine Attal, MD, PhD. “We need to increase therapeutic options for these patients… We suggest — and of course it’s only a suggestion, but it’s also based on animal studies so is in line with animal data — that Botox has a central effect on pain,” she notes. Nonetheless, “if patients have impaired function, and are in a lot of pain, they may also need other agents. Botox would not be sufficient to control everything,” she adds. Diabetes camp can positively impact children in a variety of ways, according to a new three-year survey. Bookmark DiabetesSelfManagement.com and tune in tomorrow to find out more.